TAXI TEHRAN is that rare thing - a movie that both makes you laugh out loud and makes you so angry at injustice you could scream. 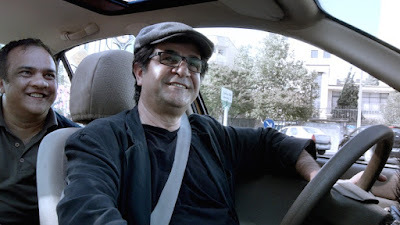 It’s directed by and stars the oppressed Iranian director Jafar Panahi - for years harassed and interrogated by the Iranian authorities, at some point banned from making films, and even if that ban were lifted, still subject to draconian censorship. But you can’t stop a film-maker creating art - even if, as in THIS IS NOT A FILM, Panahi is filmed showing how he is prevented from doing just that. And in his latest film, TAXI TEHRAN he takes an even more imaginative response to his predicament. In a spin of fellow Iranian film-maker Abbas Kiarostami’s 10, Panahi shows himself as a taxi driver driving around Tehran one day. He plays himself and it’s unclear how far his fares know or don’t know who he is - how far the action is staged or not. Panahi plays with the fourth wall, but there’s a kind of slow slide from hilarious mad-cap staged adventures into the deeply political and real. As the movie opens, Panahi picks up two different passengers who get into a heated but hilarious argument about the morality of stealing when motivated by economic necessity. They then leave the cab and Panahi’s third passenger, who we hadn’t even noticed there, reveals he knows who Panahi is and uses the cab to peddle his wares - pirated DVDs of foreign cinema. “Without me, no Woody Allen in Tehran!” The movie then shifts into a different gear as Panahi picks up his wonderfully feisty and funny neice Hana, who is making a short video for a school project. Amidst all her teasing of her beloved uncle she reveals the strictures laid down on the project by her teachers and is oblivious that the nice man serving her a drink beat up her uncle’s friend. The bolshiness - the innocence are a wonderful combination and really enliven the film as it becomes steadily darker. Finally, we see Panahi pick up his lawyer who discusses the case of a girl imprisoned for trying to attend a volleyball game. She is elegant and hopeful but ultimately they are discussing a situation of despair. And how absolutely visceral to see this movie back to back with SUFFRAGETTE and realise that women TODAY are on hunger strike for their right, not even to vote, but just to attend a sports match. Making this film is an act of courage and defiance. Watching it feels conflicted. It’s genuinely hilarious - moving - sweet - but also profoundly political and rightly disturbing. You come out of it feeling pleasure at having spent time with Hana, and the elegant lady lawyer, and Omid and all the other mad characters. But you wonder what happens to them when the camera stops rolling. What happens to a feisty young girl with a movie camera raised in a society where a movie isn’t screenable with a hero who’s a man named after an Islamic saint - where if her husband dies in a motorbike crash she has no legal right to his property - where she can’t go to a soccer match? And so, as all the most provocative, vital cinema, Panahi once again makes un angry, sad, happy and so much more. This movie is not to be missed. TAXI TEHRAN aka TAXI has a running time of 82 minutes. The movie played Berlin where Jafar Panahi won the Golden Bear and the FIPRESCI prize. The movie opened earlier this year in France, Estonia, Poland, Hong Kong, Turkey, Portugal, Hungary, Germany, Italy, and Denmark. It opens in the UK on October 30th and in Sweden on November 27th.